Before I get into my Shirley Temple retrospective, I want to mention an important new book by my friend Robert Matzen. 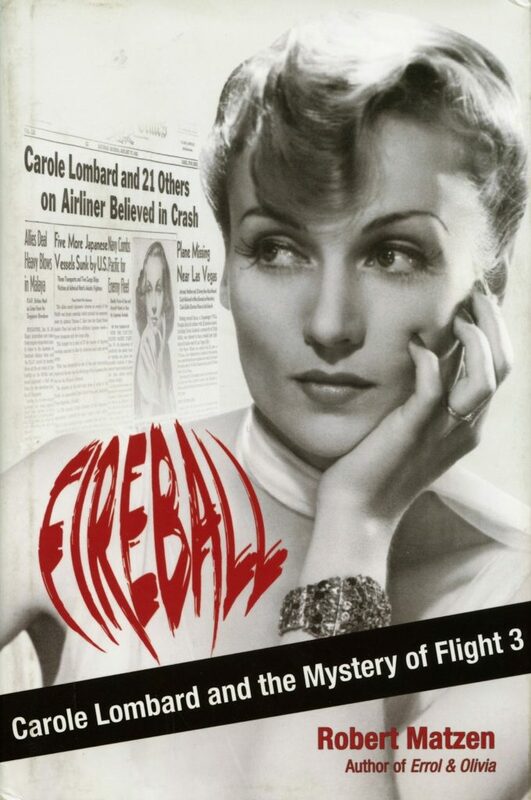 The second-best thing about Fireball: Carole Lombard and the Mystery of Flight 3 is that you don’t have to be a movie buff to find it a real page-turner; the best thing about it is that if you are a fan of classic Hollywood, and particularly of Carole Lombard, this is one of the indispensible books. Robert Matzen is the author of two other books that are proudly ensconced on my bookshelf and deserve room on yours: (1) Errol Flynn Slept Here (with Michael Mazzone), a biography of Flynn’s Mulholland Farm estate high in the Hollywood Hills, from the time he built it in 1941 until it was torn down in 1988 (after Errol was forced to sell, it became home first to songwriter Stuart Hamblen, composer of “This Ole House” and “It Is No Secret What God Can Do”, then to rock-n-roll icon Rick Nelson); and (2) Errol & Olivia: Ego and Obsession in Golden Era Hollywood, about Flynn and Olivia de Havilland, their on-screen magic and complicated off-screen relationship. The title Fireball has a three-pronged irony: it describes Carole Lombard’s feisty screen persona, her vivacious off-screen personality, and (grimly) the way she died on January 16, 1942, when the DC-3 taking her home from a World War II bond drive in her home state of Indiana flew smack into the side of a mountain outside Las Vegas, Nevada. It was less than six weeks after Pearl Harbor; Lombard had been the first Hollywood star to hit the campaign trail to sell war bonds and buck up homefront morale, and now she became the first star to die in America’s sudden new war. With a vividness that would do credit to Walter Lord — and if you’ve read Lord’s recounting of the Titanic sinking (A Night to Remember), Pearl Harbor (Day of Infamy) or the Alamo (A Time to Stand), you know what high praise that is — Robert Matzen shifts his narrative almost cinematically back and forth between witnesses on the ground in Nevada who heard TWA Flight 3 pass overhead, saw the terrible fire light up the desert sky and trekked up the sheer slopes of Potosi Mountain to look for possible survivors, and a biography of Lombard from her birth in Fort Wayne to the night she boarded that plane for her last flight. Then he takes us through the cruel business of climbing up to the smoldering wreckage in the dead of a desert winter, identifying bodies (some of them burned, mangled or lacerated beyond recognition) and bringing them down by pack-horses for proper burial — a nightmare assignment that haunted strong men for the rest of their lives, and is hardly less haunting to read about. Fireball naturally focuses on Lombard, her husband Clark Gable, who never did get over her loss, and her mother Elizabeth Peters and publicist Otto Winkler, who both died with her. 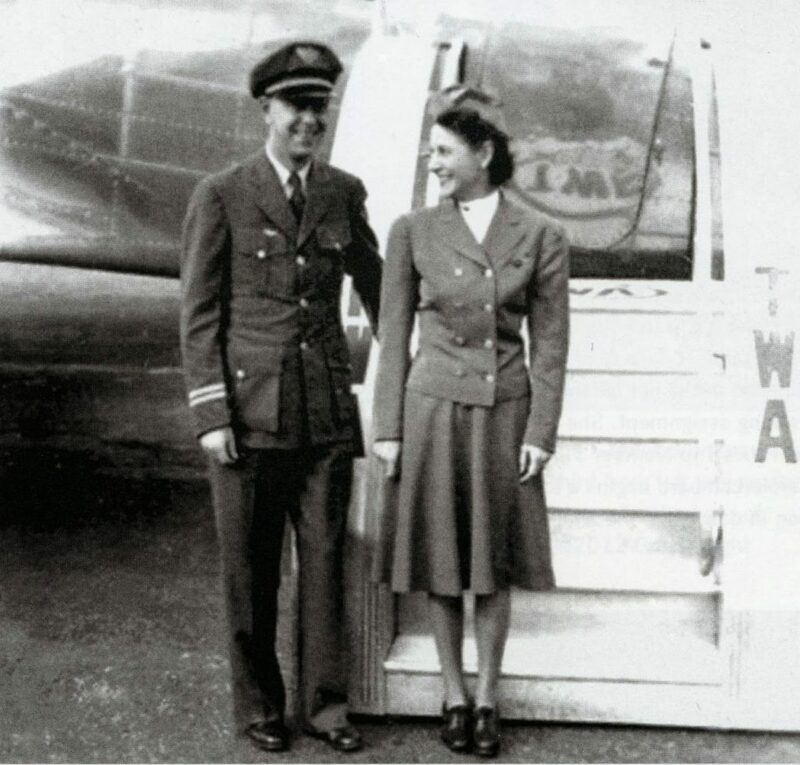 But the book doesn’t neglect the 19 others who perished on Flight 3: the 15 Army airmen, recent bride Lois Hamilton en route to Long Beach to join her Air Corps husband, and the three-person flight crew (including pilot Wayne Williams and stewardess Alice Getz, shown here). That’s what really makes Fireball such a compelling read. Robert Matzen sure did his homework, and he sketches these individuals for us through official records, letters, and the memories of friends and family. They may be forever fated to remain what they were in 1942, supporting players in the national tragedy of the loss of Carole Lombard, but Robert makes them live again for us, however briefly, and he poignantly shows what the loss of them meant to those they left behind (one airman’s young widow never remarried, and mourned her lost husband all the 66 years that remained to her). Robert even went (literally!) above and beyond, climbing Potosi Mountain (8,500 ft. above sea level) to visit the crash site, in terrain so remote and forbidding that debris from the crash remains on the mountainside over 70 years after the fact. And he speculates credibly on what we can never know for sure: what happened in the cockpit of that DC-3 in those last minutes to send a perfectly functioning airplane, under the command of TWA’s most experienced pilot, straight into the side of a mountain on a clear, calm night. This sounds like a must-read. I'm glad the author didn't neglect the others who died in that crash. Thanks for the heads-up. I've gotta have this! Sounds like a fascinating read. I'll be looking for it. Silver, Eve: By all means, check Fireball out, you won't regret it. I hope it'll also lead you to Bob's two Errol Flynn books, lavishly illustrated tomes that really bring those days to life. I have the two Errol Flynn books and they're beyond great. I'll definitely pick up his new one. Glad I'll be going three for three with him. Excellent book and an excellent review. Just curiousity, but where did you unearth the picture of Wayne Williams and Alice Getz? Welcome, Abby, and thanks for your kind comment (I thank you on behalf of Bob Matzen as well). As for the photo of Wayne Williams and Alice Getz: If you mean where did Bob unearth it, it was lent to him by Doris Brieser, the niece of Alice Getz. I, of course, scanned it from my copy of Fireball.